Jonah Goldberg says the Tea Party movement is, in part, "a delayed Bush backlash." 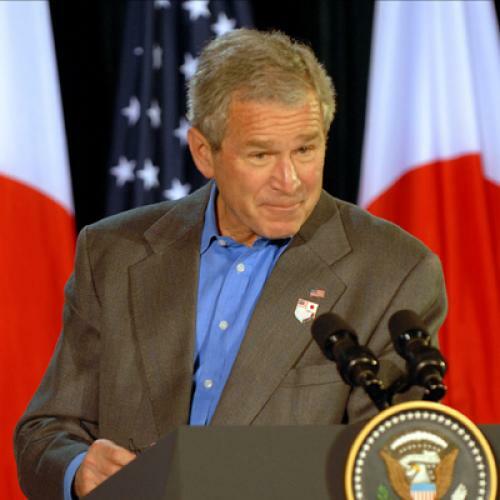 George W. Bush, the argument goes, was a squish who betrayed the conservative philosophy. But since the right had nowhere to go, the current backlash against deficits and the financial bailout is a time-released backlash against his policies, because "Conservatives don’t want to be fooled again." But they are being fooled again. Indeed, the Tea Party movement is a vehicle of the fooling. The conservative movement is organized around the principle of opposition to progressive taxation. Tax cuts -- the more regressive the better -- take priority over everything else. That was also the organizing priority of the Bush administration -- which, unsurprisingly, enjoyed overwhelming support from conservative elites and conservative voters in both 2000 and 2004. Now, one problem with the conservative movement's monomaniacal opposition to progressive taxation is that it's a poor way to shrink government spending. People don't favor tax cuts for the rich, so the only way to enact those tax cuts is to deny that there's any trade off between them and more popular spending programs. Bush was never going to be able to oppose the wildly-popular prescription drug benefit in 2000 while also favoring a huge tax cut. He may have gotten away with abandoning the prescription drug benefit in 2003 by telling the public it was no long affordable, but that would have complicated his ability to pass another huge tax cut in 2003. So he did it all and set a fiscal time bomb. The backlash against Bush from the right is largely a way of absolving conservatism of Bush's failures. Indeed, the Tea Party movement is largely driving the Republican Party along the same lines that Bush did. The central emphasis of the movement is opposition to progressive taxation -- hence the emphasis on Tax Day rallies, the defining of "Tea" as an acronym for "Taxed Enough Already," and the general Randian flavor of the movement. But the emphasis on opposing progressive taxation does serve the interests of the Republican Party just fine. If you look at the general thrust of the Tea party complaints -- the focus on taxes, the persistent denunciations of Medicare cuts -- you can see it's pushing the GOP in the direction it already wants to go, which is to replicate the policy mix of the Bush administration. This isn't a rebellion against Bush's policies but a way of displacing anger at their failure. Former GOP staffer Scott Gallupo comments, "I don’t deny the Tea Partyers’ sincerity. But anyone who doesn’t see the reality of the Dougherty scenario is simply being painfully naive." Just wait until the next Republican Contract With America comes out. It will be filled with specific promises of tax cuts and non-specific promises to cut spending. If Republicans gain power, they will -- again -- cut taxes and fail to cut spending. And conservatives will conclude once again that the leaders have failed the movement and resume their quest for more pure leaders.